GREENWICH, Conn. — There are several ways to appreciate the work ofHans Hofmann, an exuberant Abstract Expressionist who influenced generations of artists. You could bid on a Hofmann at Christie’s. Just be sure to come with tens or hundreds of thousands of dollars. You could pick up a monograph, at no small cost. The Met has a number of Hofmanns on display, but the museum will suggest that you pay $25 to get in. Alternately, you can take a stroll down West 49th Street in Manhattan, between Ninth and 10th Avenues, any day. Free. There, along the ground-floor facade of the former High School of Printing, is a boldly scintillating 64-by-11½-foot mosaic mural designed by Mr. Hofmann and executed brilliantly in 1958 by L. Vincent Foscato of Long Island City, Queens. New York’s treasury of public and semipublic artwork is so rich that it sometimes takes an out-of-town institution to remind us what we’ve got. In this case, it is the Bruce Museum in Greenwich, Conn., which has opened an exhibition called “Walls of Color: The Murals of Hans Hofmann,” curated by Professor Kenneth E. Silver of New York University. Prolific as Mr. Hofmann was, he completed only two mosaic murals before his death in 1966. They are both in Manhattan, at 711 Third Avenue and 439 West 49th Street. 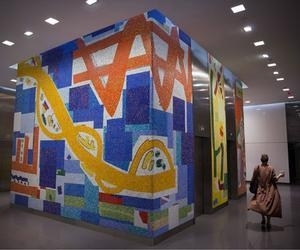 He was commissioned by the developer William Kaufman and the architect William Lescaze to create a four-sided mural wrapping around the central elevator core of a new office building at 711 Third Avenue, between 44th and 45th Streets. The 20-story tower was among the first to be constructed as the Third Avenue elevated subway came down. I thought of the people working there and I wanted to make it as springlike, as gay as possible,” Mr. Hofmann told the critic Dore Ashton of The New York Times. To match the variety of colors Mr. Hofmann proposed, Mr. Foscato had tospecially order 12 shades of tesserae from Venice, even though he had a palette of 1,400 shades in his shop. Besides the haze-clearing intensity of the oranges, yellows and blues in the piece — which must have been a tonic on Third Avenue after decades in the el’s long shadows — what makes the mural so astonishing is its joyful abandon. There is almost nothing figurative in the piece. Instead, it looks like a mix of restless collage and colossal brush strokes. SL Green Realty Corporation, which owns 711 Third Avenue, knows what a treasure it possesses. Edward Piccinich, the executive vice president for property management and construction, said the company worked with the conservator Michael Morris in caring for the mural during a 2008 lobby renovation. The continued effort of maintenance and preservation is not a casual undertaking,” Mr. Piccinich said. The mural covers more than 1,200 square feet with more than a half million tiles. It gets light dustings. Chemicals are kept away from its surface. It is monitored constantly, he said, and inspected regularly by representatives of the Renate, Hans and Maria Hofmann Trust. Acknowledging that the mosaic “was conceived, designed and constructed as an integrated component of the building’s core,” Mr. Piccinich said that because it is beyond the security turnstiles, only tenants and approved visitors are allowed access to view it in the round. It is, however, possible to glimpse one corner of the core from the near side of the turnstiles. The Bruce Museum offers an imaginative second-best: a half-scale model of the whole elevator core. It is the centerpiece of the exhibition — a kind of mural itself, composed of high-resolution photos taken at 711 Third Avenue in January. It is much easier to view Mr. Hofmann’s mural for the High School of Printing, designed by Kelly & Gruzen, which now houses the High School of Graphic Communication Arts and others. Ease of access has a disadvantage. At the moment, a graffito mars one of the succulently corn-yellow panels. It is to be removed soon, after which the whole mural will be cleaned. Professor Silver, the curator, said the Bruce Museum show is the first to be dedicated solely to Mr. Hofmann’s murals. It is to travel to Florida International University and the University of North Carolina at Chapel Hill this year and next. It will not come to New York. That seems a pity. But then again, we’ve got the murals.